pcmhacking.net - View topic - 99 Isuzu 3.5 anyone know about these ECUs? To start, I'm new to this board so hopefully my project I'm embarking on will be welcome here and there will be folks here both interested in helping as well as knowledgeable enough to help me in the areas I'm lacking in. As my day job I work as a software engineer. I primarily work in languages such as puppet, go-lang and Ruby and focus heavily in a Linux infrastructure-oriented development environment. I also know C/C++ and have spent a lot of time toying around with the arduino platform. This doesn't necessarily I"m ready to take on everything this project will most likely present me with but it shows I'm no stranger to computers and how they work. I also spent a few years as a professional automotive tech, I have been working on cars basically my whole life, am good with a wrench and am not afraid to get my hands dirty. I am a huge Isuzu enthusiast (yes we exist) I grew up in my dad's truck and now have the pleasure of owning my own. They're ultra reliable, easy to work on, and can take on just about anything off the road on the trails. This isn't to say they don't have their issues. Probably the #1 problem found on the late model Isuzu V6s (named 6VD1 3.2 and 6VE1 3.5) is their tendency to trigger CEL for a P0401 which is EGR flow insufficient. This is often times fixed by replacing the GM EGR valve, cleaning the intake side of the tube as it sometimes can get clogged with carbon or sometimes both. I want to try to establish a 3rd way of fixing this problem. And that being to delete the EGR system all-together. The benefits to this would include both lowing air intake temperatures and would lessen the amount of carbon and other junk being recirculated into the engine. I see a whole lot of delco parts on this computer. Now whether or not this is a PCM manufactured by Delco for Isuzu still remains to be seem, all I know is its made in Singapore, and contains a few Delco chips. Perhaps someone can chime in on this. Next I started to pull numbers and began identifying chips. For simplicity I have colorcoded what I have. ORANGE: DELCO 40854 even less info on this one comared to the last. PURPLE: THAILAND 50610 given its structure I believe its some sort of EPROM. Can't get much more info online about it. No pinouts etc. 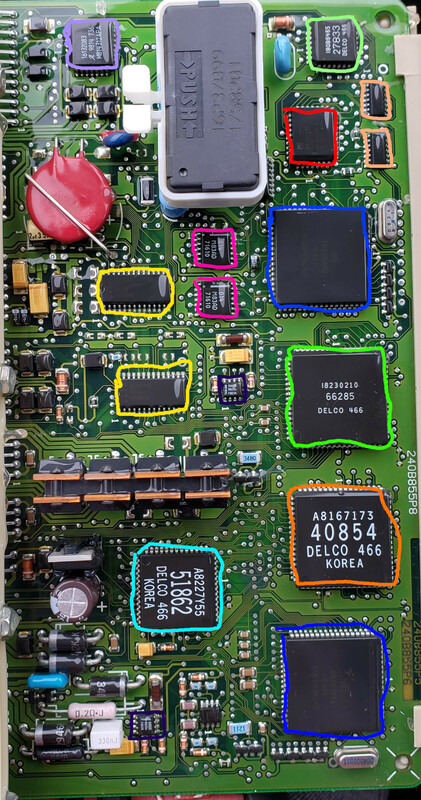 LIGHT BLUE: DELCO 51862 once again just a bunch for sale online, noticed they came in a few other ECUs saw one in a saturn and mitsubishi, weird. So at this point I think my best leads are the AMD flash memory and the 2 Motorola processors. If anybody can help get me more info about anything or what I should do next anything is appreciated! 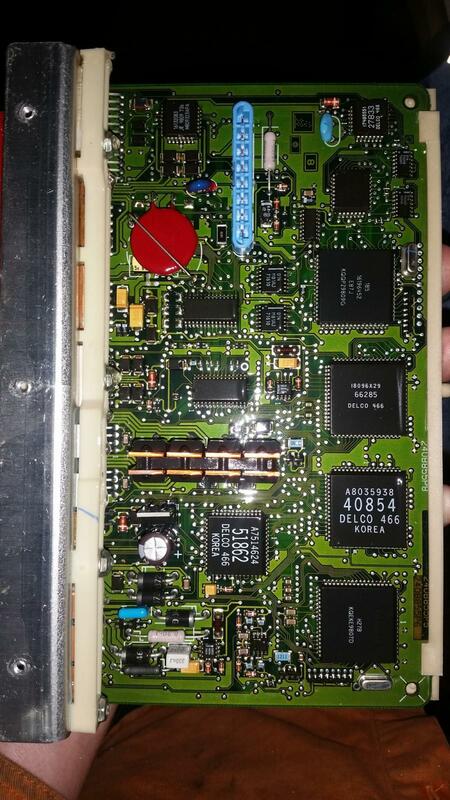 Re: 99 Isuzu 3.5 anyone know about these ECUs? I have a 2016 MUX and am well aware of the EGR problem. Just blanking it won't work with the CEL coming on. You can turn them off in the program but not sure if that's a good idea. I operated one with my Tech2 and found at idle when I closed it off the diesel knock got very loud so figured they do more than reduce NOx but also provide a smooth quiet idle. Its important to keep in mind, I'm working on a 3.5l 6VE1 which is a naturally aspirated Gasoline motor. Here's what's under the plastic cover. Some sort of IO. Not sure what this does, is it a GM specific thing? I saw a couple others online with this port. So I looked through the FSM, I didn't see anything that specifies the protocol used but given some online information I found + the fact that the factory programming /dealer scan tool is a TECH 2. I'm going with yes it uses a JPW J1850 protocol. Does anyone have experience with this reader/software? It seems open and has ability to both read and flash calibrations to the chip in question. Would anyone recommend using something different? The logo on the violet (you've called it light purple) chip is Allegro, who do interfacing stuff. Also note you've misinterpreted delcowizzid's post. 8192 baud ALDL is not J1850.